You lose the suit, and you follow your passion. In the midst of that, it's so easy to watch the challenges pile until you finally stop, frustrated and ready to give up, and you ask yourself, "why am I doing this?" Ever notice how Facebook is a collection of big announcements? "OMG MY NEW JOB STARTS MONDAY"
"Popping bottles at the day club. #ballerlife"
No one ever talks about how they were able to make coffee without spilling it all over their pants, or about how they sucked it up and finally separated their coloured laundry from their whites. 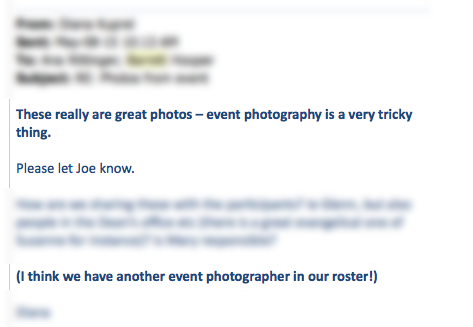 ^ A small deal that turned (for me) into a gigantic one following one of my first big photography gigs. Small victories are important. While your major victories should really be celebrated, the small victories are what will get you through your day-to-day struggles. What I'm trying to say is, you shouldn't be breaking out the champagne for learning to work your accounting software, but looking back at what you learned at the end of the day is essential to keeping your passion going. It doesn't have to be a formal list or anything; rather, think of it as a mental look at what you've done. You want to look back and be able to say, "This is what I know now that I didn't at the beginning of the day. This is what I can do now that I couldn't do before." Maybe you've found out where they keep the coffee creamer in the office, or you've discovered a new formula in Excel. Maybe you've created a new workflow for yourself in Photoshop, or you were able to refer to your students entirely from memory today instead of referring to a class list. You get the idea. ^ Small victories: An image that one of my students gave me after a teaching placement. 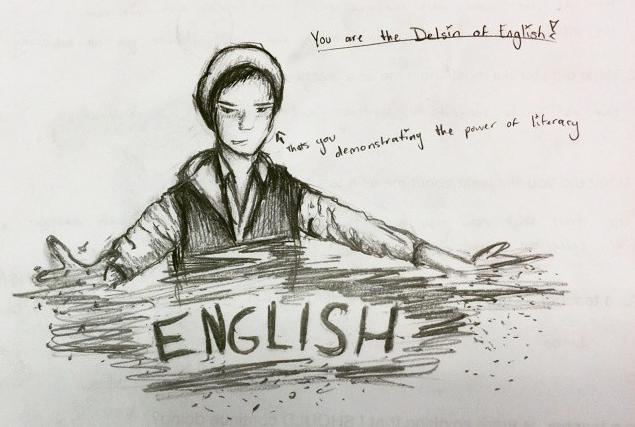 She said she didn't like English before, but she does now. Your small victories might look miniscule on their own, but compiled together after a few days, a week, a month, a year, you'll find that you've actually accomplished a lot. Remember these moments. You can keep them in your head if you want, but these are the moments that'll keep you on track when you start asking yourself "why am I doing this?" And you'll remember. And you'll keep on pressing forward.